Commuting to the place of work can be tedious for those of us living in towns and cities. Whether your place of work is just a stone throw or far away, you would still encounter some difficulties getting there and for many us, we’re stuck with public transport or the headache of parking. Life is busy and so are we so we all need easy ways of getting to work and making the daily commute less of a chore. In the last 10 years bicycles have had a resurgence and now in cities throughout the world, you’ll see bikes sharing the roads and cycle lanes of all the major towns and cities. However, biking has its challenges, as it is associated with lots of risks from other traffic. Research has shown that there is a new breed of a commuter on the rise and for many of us, it is the best, safest and the most effective way of commuting in large cities – welcome to the world of commuter scooters. The best means of commuting in cities is an adult scooter. Kiolmeter454.com is a site dedicated to this eco and user-friendly mode of transport. We’ll help you choose the best adult scooter for your needed. 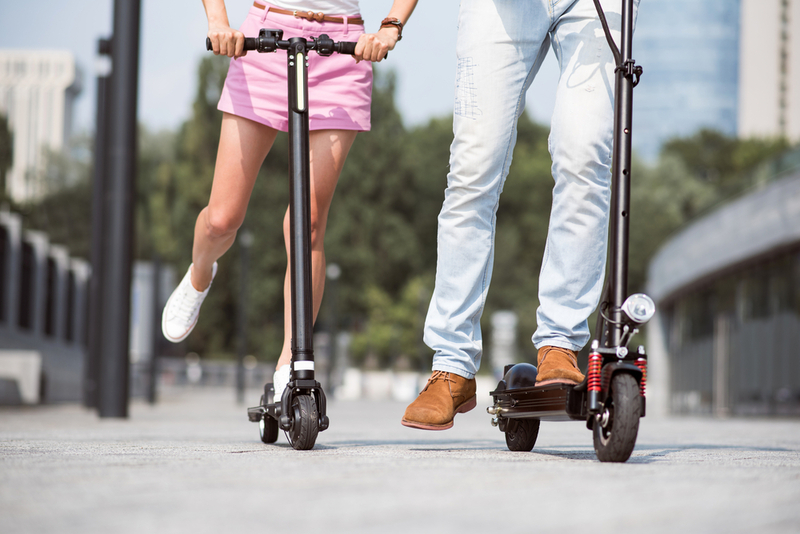 There are different kinds of scooters, which include adult and child scooters, powered scooters, stand up and sit down scooters and electric assist scooters as well. We’ll help you assess what you need for your own personal commuting needs or even if you just want to join the kids on the school run, we’ll find the nest adult scooter for you. Firstly its fun, it’s faster than walking, less sweaty than cycling and you can use a scooter for the first and last mile of your commute. They are typically easy to manoeuvre, carry and store. Overall, a scooter is highly convenient and simple to master. Once you get used to the feel of scooting, it really adds an element of fun to your day! You can master riding a scooter in minutes and it’ll slot into your daily routine effortlessly. Prepare to be a grown up but have some fun on the journey. An adult scooter looks like a child scooter but on a larger scale. The principle behind both adult and child scooters are pretty much the same. There is a deck fitted with wheels, a handlebar is attached to the deck to allow easy balance and steering. 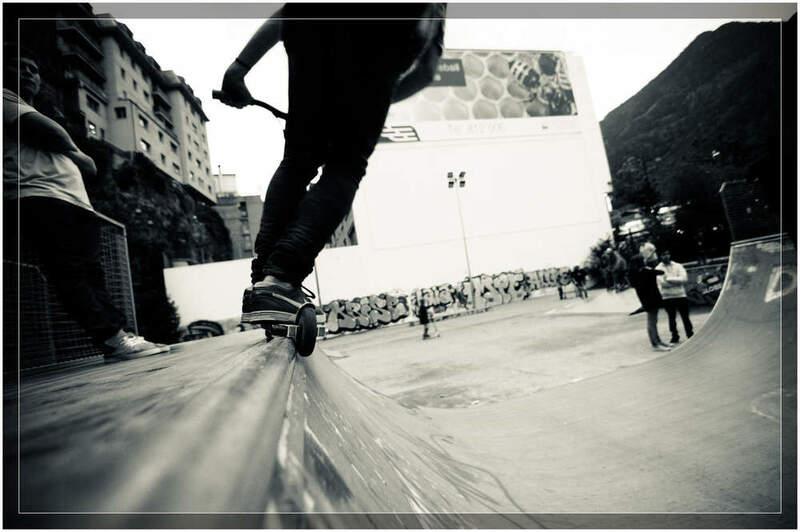 Kick scooters are ones that you propel yourself, a simple push off with the foot to gain momentum and then enjoying the ride as the wheels glide your forwards. The average scooter is accompanied with those basic features that would enable you enjoy it such as a handlebar. Handlebar can always be attached to the deck. Scooter users do not find it difficult taking off because of the self propelling feature. 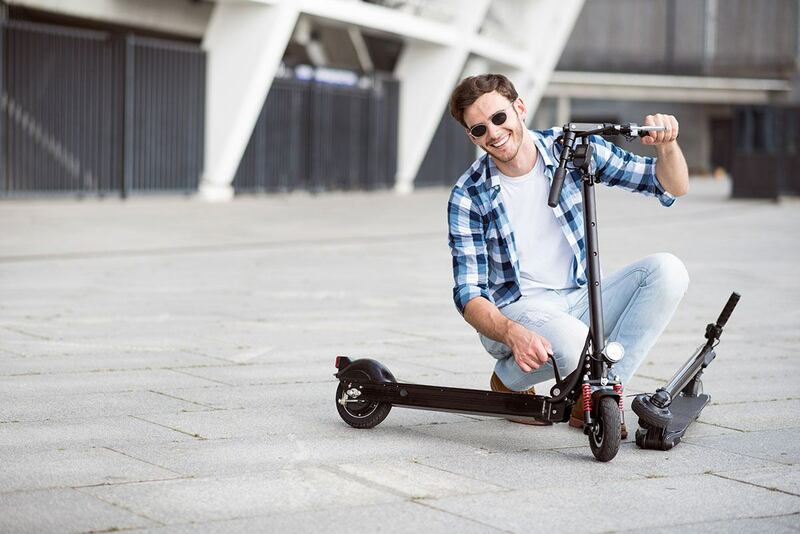 Adult scooters are designed to be ridden by adults so height and weights are different, check the scooter specifications what weight the scooter is designed to carry. Adult scooters are usually designed around comfort and stability with many elements being adjustable to provide a comfortable ride. 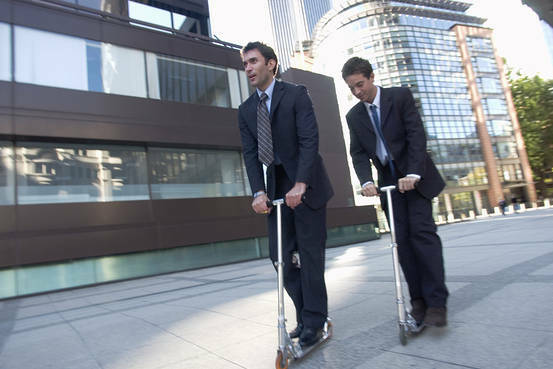 Even if you do not want to commute to your workplace with your scooter, even more adults use them it for leisure purpose. You can use it to cruise through and tour the countryside or your neighbourhood during the weekends, you can join the children on a family ride or you may just want to use it around campus to get from class to class. There is even a range of trick and stunt scooters for those seeking more of a thrill ride! Scooters are designed to get you from A to B on your journey faster than walking, so the principle is not that different from enjoying a bike ride. There are several benefits that you can derive from scooters that make them a better option than a bicycle and here are some of the advantages. The greatest benefit you can get from scooters over bikes is the issue of storage. If you are confronted with a storage problem in your home, it may not be a wise decision to opt for bikes this is because storage is going to be a problem. A scooter takes up a lot less space and the majority of models now fold to even a smaller size than the riding position. If you store your bicycles in unsecured places outside your home chances are there that it might be stolen. You can comfortably fold and pack your scooters in small spaces in your home without causing obstruction. Another benefit you can derive from using your scooter over a bicycle is that it does not pose any travelling inconvenience. If you use public transport it can be awkward to travel with your bike without causing some inconveniences to you and other travelers. Even popular folding bikes take up considerably more space than even one of the larger and more robust scooter models. This is not the issue with adult scooters, you can conveniently travel with it without having the problem of storage. It can slide behind your seat, alongside you and fit snugly into luggage racks. If you are traveling, you can store your scooter in your closet. In your home, it can be stored under the desk. You can equally put in your car trunk. It is more convenient to use and this is one of the things that make it more popular and more cost effective than bicycles. Perhaps the greatest benefit users derive from scooters over bicycle is the issue of safety. If you are in imminent danger of an accident with your scooter, you take simple measures to prevent it. This means that with scooters, you can sustain less or no injuries when compared to bicycles. Scooters are safer because they offers better control and they are highly maneuverable. If you are running into a situation with your scooter, decelerate and simply step off. This is the opposite with the bicycle. If you lose control of your bike, you may be heading for a serious crash. Also, scooters are typically used on footpaths whereas bikes tend to need to be ridden on roads with other vehicles. Thus making the risk of an accident caused by others greater. Do check your local law for whether you can ride scooters on paths rather than on roads. Most importantly, it is safer to use scooters in the cities than bikes. Municipal councils have laws in place that regulate the use of bikes in the cities and this is not the case with the scooter. If you are a bike rider, you must be familiar with these laws and you must always be conscious of them whenever you are riding. For instance, bicycle riders would be required to use certain lanes and several other regulations they would always observe. This is not the case with scooters. There are no such regulations or legislations regulating its use in most place. This does not mean that you should not be careful while using scooters. You have to take some safety measures, but you are not required by law to ride amongst cars and other city vehicles that could pose a risk. When you compare the two in terms of their construction, you are going to discover that scooters have an edge because of their low center of gravity. This is not the case with bicycles. Because of the low center of gravity, users are sure of stability while riding. Even if you are on the highest speed, the scooter is stable and this can minimize accident and allows for better control. In addition to that, scooters are fitted with foot grip feature. There are different kinds of scooters on the market today and many of them are manufactured with superior quality aluminum and magnesium materials. The advantage is that they are lightweight and sturdily constructed. You can get a superior brand that can hold a weight of two hundred and fifty pounds and more than that. Some scooters are lightweight that they do not weigh more than ten pounds. Because of the lightweight, it makes it easier to carry. It is a question of folding and carrying it to your destination. This is not an issue with bicycles. Even foldable bicycles are still heavy making it difficult to carry. It’s Time For You To Scoot! Scooters are increasingly considered as a great and fun way to get some daily exercise! 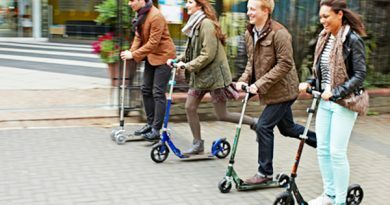 There is even a gorwing movement based around using scooters as part of a specific exercise plan, “Scootersize” is taking off in areas such as Japan and the UK. It may look as if it does not consume your energy when you ride a scooter, but you can expend a lot of calories when you ride it as you are propelling your own bodyweight along. Secondly, if you had used the two, you would discover that it is more convenient to ride a scooter than a bicycle. For instance, if you ride a scooter, you are not going to be bothered by such things like storage area, spaces for parking, as well as local regulations. Most importantly, you are going to discover that it would be easier and comfortable when compared to bicycle riding. No uncomfortable saddles to deal with and no needing to carry bike locks or even use helmets. Thirdly, you are going to save money when you own a scooter. This is because it does not use gas like your car and they are not as expensive to purchase as cycles, and this means that you are going to save when you buy the scooter and save when you use it as well. The prices can be compared with that of a bike and you discover that it does not require constant maintenance and this is another way of saving money when compared to riding a bicycle. Fourthly and very importantly, scooters are more environmentally friendly. It does not use fuel and this means that it saves the environment carbon dioxide emissions, which are considered as one of the major causes of pollution. To ensure that carbon footprints are reduced, it is recommended that you use scooters instead of your car where you can. Finally, many people once they discover scooting choose it because of the fun that is associated with it. If you like, you can use it to cruise round the city and you are going to derive fun doing that. You would be surprised that you are going to get more fun from this than you would get from biking. You can consider this is an important family asset and it makes great sense if you purchase one for other family members. Now that you have seen some of the great benefits that you can derive from using scooters. It is great for work and good for play. It is going to make life easier for you. Adult scooters or the semblance of them have always been around for more than a century. People were using locally prepared handmade scooters long before commercial scooters were in the market. These early scooters were composed of skate wheels boards attached to rollers. This product was not the best because there was difficulty in moving it around. However, it was in 1974 that the first kick scooter was produced by Honda. There is not much difference between their products and the early design because there is still the difficulty in moving it around. This notwithstanding, it was widely accepted as it gained popularity. Wim Outboter produced the first modern scooter in 1996 and this was produced from foldable aluminum material. He attached to the deck inline skate wheels and marketed the product. He produced this for his sister who was handicapped. This product was better for her when compared to a bicycle or roller stakes. In the year 1999, Razor scooter was introduced and it became very popular in Japan, and it was seen as a fun toy and many people used it for transportation because of the convenience. 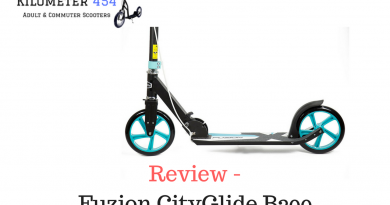 Today there is a tremendous improvement as it has evolved from an ordinary razor design to scooters with multiple wheels and other fantastic features. Scooters are designed for family, children and adult racing and stunts. Today, it is a viable means of transportation for many people, especially adults in and around towns and cities. Scooters are good because they can be used for short distances as it can speed up your trips. It is faster at least three times faster when compared to walking. It is good for getting to offices. If you are a student, you can hop on your scooter and easily zip around the largest and most sprawling around the campus. Many students prefer to use it on the campus because it is much easier to maneuver it in crowded places, more so than a bike. After cruising the campus, you can just fold it and take it along to your class for lectures. It is possible to get scooters that are as efficient as bikes and look for the cruiser style with the very large wheels. This has big wheels and that can be at least sixty to seventy percent efficient as your bike. If you want to use small wheeled kick scooters, it can be at least fifty percent efficient as your bike. If you want to exercise, you can resort to kick scooters, five kilometers rides would make a great difference. You can see that apart from deriving fun of it. The product is one of the best fitness tools out there for you. 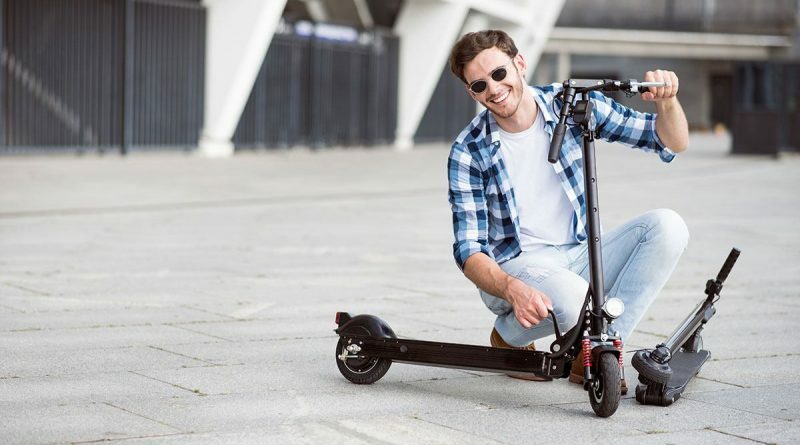 The vast majority of scooters now can be folded and this is great for commuters. You can take it on the train and the bus, and pretty much any other means of transportation. A scooter is great, especially in the rush hour as all that you need to do is simply fold it and take it along with you. Unlike a bike, it’s easy to ride, if you can ride a bike and haven’t done so for some time, the learning curve can be quite high to get your confidence to a level where you are ready to commute, not so with a scooter, hop on find your balance, get used to the speed and you are off! Road Danger – Use a Footpath! If you live in a town or a city, the major setback to the use of a bike for many of us is the real threat of road danger. Where inner cities are catching on to the need for bicycle specific infrastructures and cycle paths, there is still many areas where this is not common. Many people would not even consider biking in the inner cities, especially taking it to the workplace because it can be dangerous, there is rarely a day where there is not some sad tale of a serious cycle accident or fatality on our ever busier roads. Because of the danger associated with road biking, many people would prefer kick scooter because it can make a better alternative and the trend is growing in many cities of the world. It is safer and more comfortable to use scooters than bike and being on a pavement brings numerous benefits. Apart from the issue of injury risk, another problem that makes it difficult for many people to take to the road bike is the issue of stress. Exercise is always recommended because it is a way of unwinding. However, there could be danger of engaging in this form of exercise with your bike because there are dangers associated with it, which include bad roads, and reckless driving on the roads which could endanger the lives of bike riders. If you’ve ever hit a pothole in a poorly maintained road, you’ll know exactly what I mean, The biggest risk with Scooters tend to be keeping a vigilant eye on pedestrians and watching out for kerbs. Price and the weight are other important things to consider when you are making the comparison between scooters and other forms of transport. Scooters are generally cheaper than bikes. You would be surprised to learn that the cost of kick or micro scooters are somewhere around the tenth to the half of the cost of a foldable bike. Moreover, scooters do not cost much to maintain. If you like, you can roll your scooters into the front wheel. They are designed with slim profiles. This makes scooters easier to store when compared to the foldable bikes. We’re not here to rubbish bikes, cycling can work well for a commute if you have the means and the confidence. Riding up a hill is much easier for a bike, but if you are looking for a perfect walkout, then you can always opt for scooters. Also, you can opt for an electric scooter or an electric assist style scooter to give you that extra boost when dealing with inclines.If you want to use scooters on a hill, you are going to enjoy it when you scoot down. It is better to walk up and scoot down. Most people who use it in the hill use it this way. Even if you like, you can look for those scooters with electric assistance. This can take you to the fill faster and you can descend faster as well. There are different kinds of scooters on the market today and you have to study them to know those that you can start using. If you want to use scooters on a hill, you are going to enjoy it when you scoot down. It is better to walk up and scoot down if you don’t have an electric scooter. There are different kinds of scooters on the market today and we can help you decide the best one for you based on the look, feel and function. Hilly terrain, go with an electric or electric assist. The lightest and the cheapest scooter remains the adult urban kick scooter. This device is good because it is not difficult to fold, and it is fitted with larger wheels and is typically strong, sturdy but usually light weight. They are designed with softer tires and some are fitted with spring suspension features. Some of them have both rear and front brakes. These features made these scooters comfortable, safe and convenient to use. This is often referred to as electric adult scooters. This scooter is heavier and it is the version of the adult folding micro scooter. 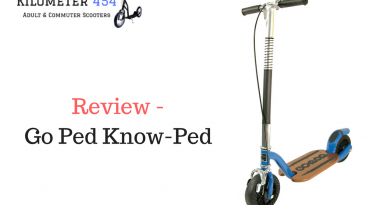 It is fitted with a lithium battery and it works at the typical range of 5KMPH to 30KMPH. The distance that it can cover is ten to thirty miles on just one charge. As expected, this kind of scooter is heavier and this can be attributed to the additional features like motors. These kinds of scooters are becoming popular and that is because of the fact that they are reducing emission to the environment and allowing scooter riders to master longer distances and more challenging terrain like hills. The new versions on the market are not bulky, which means that they are lightweight. They are becoming more popular. Even if the batteries are not strong enough you can still kick start it. This means a scooter that has a seat, the seat can usually be removed so that you can stand instead of sitting, but the choice depends on you and your needs. The type of journey you make would determine the choice you make. Some of these bikes could not fold and this means that you have to lock it to your bike rack. This can still be a cheaper option than electric bikes. 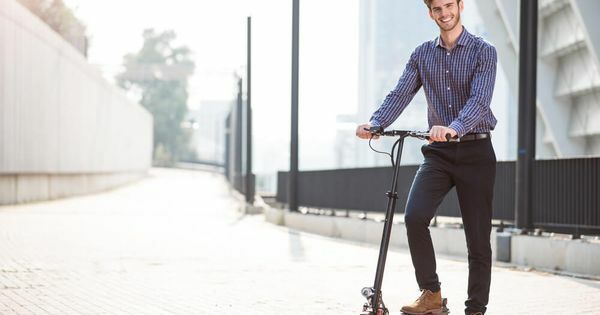 The adult scooter trend is really only just getting started, more scooters are coming onto the market as demand continues to grow. 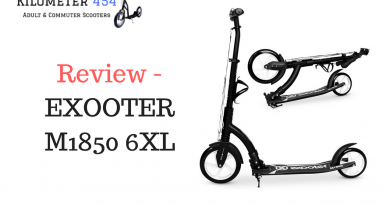 The team at Kilometer454.com will continue to research, review and report on all the latest adult scooter products and news.